Since 1980 the U.S. has engaged in aggressive military action in 14 countries in the Islamic world alone, according to research published in the Washington Post: Iran (1980, 1987-1988), Libya (1981, 1986, 1989, 2011), Lebanon (1983), Kuwait (1991), Iraq (1991-2011, 2014-present), Somalia (1992-1993, 2007-present), Bosnia (1995), Saudi Arabia (1991, 1996), Afghanistan (1998, 2001-present), Sudan (1998), Kosovo (1999), Yemen (2000, 2002-prsent), Pakistan (2004-present) and now Syria. In this hemisphere, U.S. military forces invaded Grenada (1983) and Panama (1989) and landed 20,000 military forces in Haiti (1994). The U.S. has 1.3 million people in the military, and another 1 million serve in the military reserves. The U.S. has over 700 military bases in 63 countries across the world, deploying over 255,000 U.S. military personnel there. The Department of Defense officially manages over 555,000 buildings on 4,400 properties inside the U.S., and on over 700 properties across the globe. The U.S. has over 1,500 strategic nuclear warheads; over 13,000 military aircraft; dozens of submarines, many of which carry nuclear weapons; and 88 destroyer warships. Nearly 7,000 U.S. military people died as a result of the wars waged by the U.S. since 9/11. Just as important, in Iraq over 216,000 combatants, most of them civilians, have died since the 2003 invasion. Some estimates of Iraq casualties are double that. No one even counted civilian deaths in Afghanistan for the first five years of our war there. Our drone attacks have murdered hundreds of children and civilian adults in Pakistan, and dozens more in Yemen. U.S. military spending is about the same as the total of military spending by the next eight largest countries combined -- that is, more than China, Russia, Saudi Arabia, France, the UK, India and Germany combined. Since 9/11 U.S. spending on our military cost well over $3 trillion. Direct combat and reconstruction costs for wars in Afghanistan and Iraq since 9/11 have officially cost U.S. taxpayers $1.6 trillion dollars, according to the Congressional Research Service. Additional trillions have been spent on growing the Pentagon budget, and for present and future increased health and disability benefits for veterans. The U.S. military captures 55 percent of our national discretionary spending, and spending on veterans benefits is another 6 percent. Since 9/11 military spending has increased by 50 percent, while spending on other discretionary domestic spending increased by 13 percent, according to the National Priorities Project. The number-one war profiteer is Lockheed Martin, according to USA Today, with annual arms sales of $36 billion. Not surprisingly, Lockheed Martin spends over $14 million a year on lobbying the people who make the decisions about how much money is spent on weapons and which weapons will be purchased. Their CEO is paid over $15 million, according to their 2015 shareholder report, and on their board is James Ellis, a former admiral and commander in chief of U.S. Strategic Air Command, who gets paid over $277,000 for the part-time work, and James Loy, former Deputy Secretary of Homeland Security, who gets over $260,000 for his part-time work. Lockheed receives substantial government contracts, amounting, by one calculation, to over $260 from each taxpaying household in the U.S. They are so entitled that a 2014 special investigation by the U.S. Department of Energy found that Lockheed used taxpayer funds to lobby for more taxpayer funds. The number-two war profiteer is Boeing, with annual arms sales of $31 billion. Boeings spends over $16 million a year on lobbying. 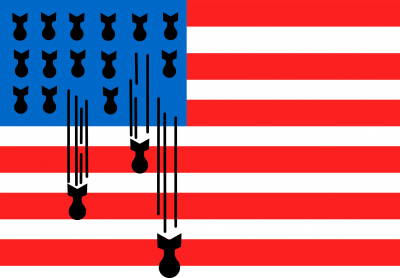 The rest of the top ten corporations profiting from war include BAE Systems, General Dynamics, Raytheon, EADS, Finmeccanica, L-3 Communications, and United Technologies. You can track their corporate contributions to members of Congress, especially the politicians on the Appropriations Committees of the House and Senate, on Open Secrets. And these war profiteers do not just sell to the U.S. government. The U.S. sold more than $26 billion in weapons to foreign nations and has been number one for a long time, though recently that title has been going back and forth with Russia. On April 4, 1967, in his famous Riverside Church address, Martin Luther King Jr. said the U.S. government was the greatest purveyor of violence in the world. In response, he called for a true revolution of values. This revolution calls us to question the fairness and justice of many of our past and present policies, including war and the contrast of wealth and poverty in our own country and across the world. As he left office, former U.S. President and General Dwight Eisenhower warned citizens of the growing military-industrial complex. He saw the influence of the war machine and urged all citizens to be alert and force "the huge industrial and military machinery of defense" to respond to democracy and the peoples' desires for peace. What must we do? First, we must learn the facts and face the truth that the U.S. is the biggest war maker in the world. Second, we must commit ourselves and organize others to a true revolution of values and confront the corporations and politicians who continue to push our nation into war and inflate the military budget with the hot air of permanent fear mongering. Third, we must admit what our country has been doing wrong, and we must make amends for the violence that the U.S. has waged on countries all over our world. Fourth, we must withdraw our military from all other countries, dramatically downsize our military, disarm our nuclear weapons, and truly stick to defending our own country. Fifth, we must work for peaceful, just solutions to conflict here at home and across our world. Only when we work for the day when the U.S. is no longer the world leader in war will we have the right to pray for peace on Memorial Day.